An easy-to-use “handsfree” foot file. Our product is a “hands free”, ergonomic foot file which you easily add to your shower floor/ tiles or bathtub with the help of 3 suction cups, mounted into the bottom "sole" of the file. By simply pressing the set of suction cups towards a smooth surface, the file stays securely in place. For pictures, please see below under "Pictures". The product is hollowed, which makes it very light. It has an appealing design and creates a nice feature in the bathroom - which most other foot files do not. It enables filing areas of the feet that many other foot files do not reach. It is also very easy to clean since it is (mainly) used in the shower/bath. The file can be used by anyone (except children), but is especially suitable for people with overweight and other physical disabilities - regular foot files are often very difficult to use by people with physical disabilities since you have to bend down in order to use them. In 2018, more than 2 in 3 adults were considered to be overweight or have obesity in the US (and also in the UK where we also have a registered patent). In 2018, the adult population age 18 and over was approximately 245 million in the US. Except for private consumer use with a huge gift market potential (see more below), the file also has great potential in B2B sales (hospitals, nursery homes, rehabilitation centers, retirement homes etc). The foot file has previously been produced in China and sold by an exclusive licensee. This agreement has been terminated by us and since our company is mainly working with product development, we are now in the process of selling these IP rights or license them out. With registered patents in both China and USA (further info below), there are great potential and possibilities for extensive sales of this product, for example, by selling the product in the US and having the manufacturing in China. We have registered customs surveillance of this patent/product with the Chinese customs, based on the Chinese patent, which enables to control the production in China (if decided to be in China) and counterfeits/copies coming out from China. The product is made in a plastic material with an abrasive surface. The abrasive material covers the whole product. The suction cups are made of plastic. The user scrubs the foot to the foot file in a standing, sitting or lying (for bathtub use) position. The file offers very easy ways to scrub different parts of the feet and toes: The rails are shaped for the side of the toes, the vertical walls are shaped for the outside of feet and toes, the upper part of the file fits the cavity of the foot valve (most hand held foot files can’t reach this area), the rear cavity (the slope) is designed for an instinctively natural downward motion and the frontal cavity of the file is shaped for removing excess skin from the heel. Please see patent registrations for further details. In 2012 patents were registered in the US (US Design Patent reg no D577153) and China (Invention Patent reg no CN ZL200680016243.8). 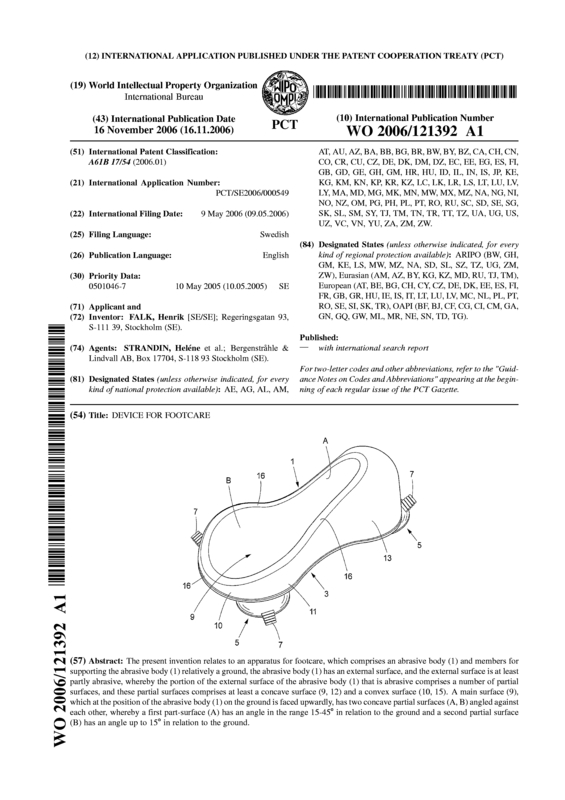 EPO patent application (Patent Application no EP 06733401.1). The sales can also include a beautiful designed logotype and package design with a cool "retro-feeling" (pictures below), designed by a well known Swedish artist. This is why the foot file also has a great potential to be sold in the gift market sector. Other foot files are not packaged in this way why they are not attracting this huge market. The branding concept is developed together with a professional Swedish PR agency and includes more than the package itself. There are also possibilities to license the IP rights, also together with the package design.